1. A plentiful supply of material goods: Many foreigners have been amazed by the affluence and luxury of Americans. 2. An abundance of riches, wealth, or opulence: By choosing the right business, the family progressed from poverty to affluence within a few years. 3. An abundant supply, as of thoughts or words; profusion: William had an affluence of ideas for the new project. 4. A flowing to or toward a point: The patient had an abnormal affluence of blood to the head. 5. 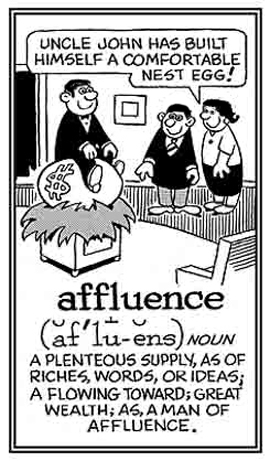 Etymology: affluent and affluence are derived from Latin affluere, "to flow freely and in abundance". By the way, have you ever heard of anyone who suffered from affluenza? Affluence is the wealth more often attained by a will of your own than by the will of a relative. 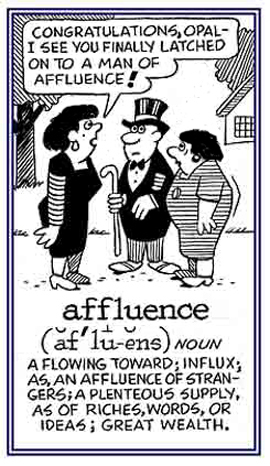 Some people get their affluence through influence.